Mmmmm, best impulse purchase I have made in quite some time, now time to go out and look for a custom frame. i still kinda want to get these but i already have the posters that came with the pre-orders. if you don't have the income for these prints, maybe you'll wanna try this. i wish they were actual paintings and not just prints. you know? i think the cat in your sig has some form of terets. I have the On Letting Go print my girlfriend gave me it as an early Christmas gift. It looks amazing and I'm really happy because I went to buy one and they were sold out. Now I just need a frame. Edit: I would really like circa to sign it but I don't think carrying that around is a great idea. I am going to see Anthony on the 30th at the First Unitarian (sp?) I'm debating bringing it because it would really special if I could at least get him to sign it. I picked up "Letting Go" and just received it yesterday. It looks beautiful on my wall. My Juturna came in the mail today, and I only ordered it maybe 3-4 days go? Surprisingly fast. Just need a nice frame. Esao made 6 new prints, one of which is relevant to Circa Survive. "Monsoon" was used as the cover art for the vinyl release of "Juturna"
and fortunately for Esao, the prints for "Monsoon" sold out in one day. I'm sure many of people from this board contributed to it selling out so quickly. Image size 10.5" x 12.5"
I really like the "permanent voyage" and "separate lives" prints available right now as well, just beautiful and thought provoking work. 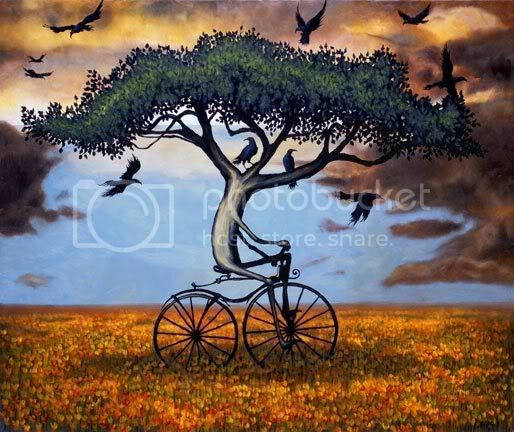 If anyone purchased the "Letting go" limited edition print from Esao Andrews, would you be willing to sell it? I was unable to afford it when it went on sale several months ago. But I got my tax refund and am willing to offer $200 for it. As long as you have not stuck thumb tacks or tape on it (i.e. it's in mint condition). If you framed it, then I can only offer $175 because chances are it may have been unprofessionally framed (and therefore damaged). I can throw in a couple of Circa Survive t-shirts. Remember the pre-order special? They had the $6 white shirts and $6 black shirts? I can throw in 1 of each (new, unworn). Size large. That's in addition to the $200 I'm offering. Does anyone know why Esao's store is closed? read the latest blog entry. Image size 9.5" x 12.5"
it's time for him to make a larger amount of prints. damnit, i would have bought both of these. missed out this time. crap! I have the first print (had it framed and it looks amazing) and this one would be awesome to compliment it! I would gladly pay big money to anyone who could help me putting my hands on these Esao Andrews prints, especially the first On Letting Go print. I'm sure everyone who has it probably love it a lot and will want to keep it, but it never hurts to try.I grabbed the Other Half earlier this week and I feel the urge to complete the set. I'm hook on this guy's work big time!! !Sooo talented... let me know if you think you could help.. much appreciated. these prints pop up on ebay from time to time.